There are three keys to a smooth Health Department inspection: maintaining a clean facility, keeping your paperwork in order, and...let's see. We can't think of the third one. We can't. Sorry. Oops. There were more familiar faces on the city's inspection site this week. We'll start off with the only one to earn a citation, though we're not sure why it did. Spanish Flowers (4701 N. Main) got stuck with only three violations - food held at the improper internal temperature, food-contact surfaces of utensils/equipment not properly sanitized with hot water or chlorine, and potentially hazardous food not marked with a disposal time. Those aren't trifling, but we've seen much worse offenders escape un-cited. Maybe management should have tried bribing the inspector(s) with some of that free soup. Just kidding, that would only work if they were really thirsty. Kay's Lounge (2324 Bissonnet) scored dive-bar points by earning the following violations: wall/ceiling not in good repair, and insufficient ventilation to keep the room free of smoke, vapors and obnoxious odors, among other things. Kay's Lounge confused the hell out of us by earning a violation for "milk/milk products for drinking not being provided from an unopened/commercially filled package." Maybe it was something to do with the cream used for White Russians. We have no other theories. Inspectors hit Brennan's (3300 Smith) with four violations: using moist clothes for spills, equipment/glassware/utensils/plates handled in a way that could cause contamination, wall/ceiling not in good repair, and washed utensils/equipment not rinsed well enough to remove cleaning agents. 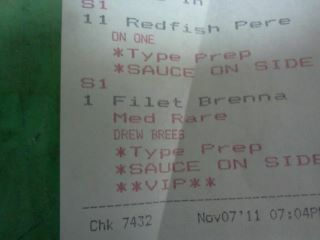 On another note, if you're curious what Drew Brees eats at the Brennan's in New Orleans, check this out. Another week, another sparkling clean strip-club buffet: Centerfolds (6166 Richmond) had a violation-free buffet and a kitchen where the only issue was floors not maintained in good repair. This is joyous news. Khyber North Indian Grill (2510 Richmond), in addition to not utilizing effective measures to minimize a potential insect presence, earned violations for not posting hand-washing signs near sinks and no-smoking signs near entrances. Apparently management's attention is focused on the main sign, which is used to mock Pappadeaux's sign next door, which got the L.A. Times' attention a few years back, so who's counting? Awful Wording of the Week: The YES Prep school in Fifth Ward (1305 Benson) got hit with a few violations, including "Certified food service manager while on duty not possessing on his person the certification card." This is why education is so important.